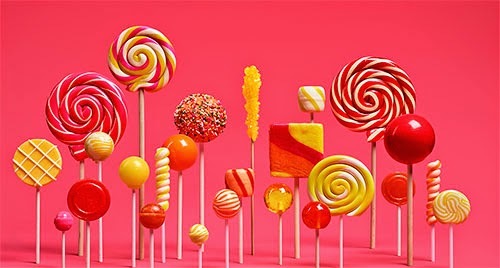 GOOGLE Android L is Official "Lollipop"
Home » Android » Android 5.0 » Google » Lollipop » News » Nexus » Technology » GOOGLE Android L is Official "Lollipop"
The new version of the Google's operating system is called "Lollipop." The search engine giant announced the official name of Android 5.0 Lollipop and will be launched on 3 new Nexus devices. The three Nexus devices are Nexus 6 mobile phone, Nexus 9 tablet, and Nexus Player streaming media device, according to The Verge. It also become available on other Nexus devices in the coming weeks, such as Nexus 4, Nexus 5, Nexus 7, Nexus 10, and Google Play Edition devices. You'll noticed the new feature of Android 5.0 Lollipop in its visual and user interface. It has more fluid animations, a cleaner design with a bolder color palette, a revamped multittasking menu, and offers new ways to interact with your voice. There are so much more new features that you couldn't imagine in one device where such as songs, photos, apps, and recent searches can be seamlessly synced across various Android devices. You probably love the Android 5.0 Lollipop once you experience it at your own hand. According to The Verge, "Google has confirmed that the Nexus 4 will receive an update to Android 5.0 Lollipop and this article has been updated to reflect that." For more Android 5.0 Lollipop related information, Please bookmark this page for updates and you may also share this post to your friends. Comments or suggestions about "GOOGLE Android L is Official "Lollipop"" is important to us, you may share it by using the comment box below.